This image, taken by the European Space Agency's Sentinel-2 satellite on Dec. 5, 2017, shows a massive burn scar just east of the California city of Ventura, along with areas of active fires. Satellite photos show just how big and destructive the Southern California wildfires have become. A dramatic image captured Tuesday (Dec. 5) by the European Space Agency's Sentinel-2 spacecraft, for example, reveals a massive burn scar just east of the city of Ventura, along with areas of active fires. Smoke billows into the air in the Sentinel-2 photo, as it does in another image captured Tuesday by the Moderate Resolution Imaging Spectroradiometer (MODIS) instrument aboard NASA's Terra satellite. 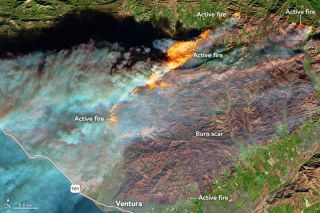 The MODIS shot takes a wider view than that of Sentinel-2, showing thick smoke flowing west into the Pacific Ocean from the Ventura area and the hills just north of Los Angeles. The Moderate Resolution Imaging Spectroradiometer (MODIS) instrument aboard NASA's Terra satellite captured this view of smoke from the Southern California wildfires on Dec. 5, 2017. The fires really started ramping up Monday, spreading quickly due to Southern California's famous Santa Ana winds. As of Wednesday afternoon, the blazes had torched a total of 83,000 acres (33,600 hectares), according to CNN. These wildfires follow closely on the heels of a set of blazes that tore through Northern California in October, burning at least 245,000 acres (99,150 hectares), killing more than 40 people and destroying about 8,900 houses and other buildings. Satellites such as Terra and Sentinel-2 also got good looks at these fires and the devastation they caused.